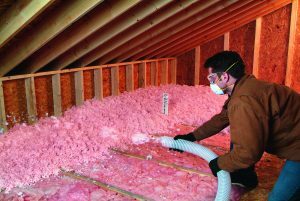 There are many different types of insulation to use in your home’s walls, attic and basement, but the two most types of insulation are fiberglass and cellulose. They share some similarities and have difference and the application will generally dictate which substance you will use. Both cellulose and fiberglass are the two most inexpensive insulation products that you can use and fiberglass is the most common product for insulation outpacing cellulose by 50-1. Both share common characteristics and both are in direct competition for the residential insulation market and offer distinct options when deciding what type of product to use. Fiberglass insulation is the easiest insulation product on the market to install and if installed correctly the most effective product on the market for home attic insulation. When using cellulose – blown-in dry insulation – it requires a machine to achieve its’ purpose and a training session from wherever you rent the blower from. Both products have similar R-values per inch, but it can vary due to the circumstances that affect your home. Insulation settling can be a problem as temperatures and wind washing are all common problems that will affect the insulation’s ability to keep heat in the house. Both types of insulation require an air barrier to be installed at the time the insulation is added, and fiberglass is susceptible to air leakage and that will affect the R-value of the product installed. Moisture can absorbed by both products and each has the capacity to dry quickly, yet in a damp environment like a basement it could be problematic. AS mentioned previously, both products react differently to flame and fire if fiberglass insulation is exposed to flame and fire it will melt as it is made up of glass fibres. Problem though, is the wrapping that comes with batts, it is flammable and could ignite if expose to open flame. As for cellulose, it is heavily treated with chemicals to reduce its flammability, and while the chemicals may not be harmful to humans they are highly effective. When making a product choice for you insulation needs, always contact a professional for their advice, as each product works in different applications and no two applications are alike. Also, you need to take into consideration the weather in your area and the lifestyle you lead to help make the decision is easy.